2010: The World Cup where superstars stumbled? This World Cup was supposed to belong to the superstars: Lionel Messi, Cristiano Ronaldo and Wayne Rooney. All three players had fantastic campaigns with their respective clubs and everyone expected their goals to light up this tournament. They did, after all, score a combined 110 goals over the last season. However, as the semifinals loom large here in South Africa, all three superstars have flown home and will have to watch the final games on television. Between them, they played 13 games and scored just one goal. So what went wrong? Well, it is impossible to generalize and use the same explanation for every player, so let’s take it one case at a time. Messi scored 43 goals in 49 games for Spanish champions Barcelona, but at the World Cup he couldn’t hit the back of the net once. Now I believe Leo was actually unlucky not to get his name on the score sheet. He had 15 shots on target, but found some inspired goalkeepers in his way. The major problem, though, was that he was asked to do too much. At Barcelona, he normally receives the ball relatively close to the area, while with Argentina, he often had to pick it up on the halfway line. It was common to see Messi tracking back and having to be the playmaker and then at the same time trying to finish off the moves himself. It was just too much. The reigning World Player of the Year wasted too much energy in areas which should have been occupied by midfielders, not a forward like him. As a result, most of his shots on target were either from outside the area (11 out of 15), or after he had made a 30 or 40-yard run. He is a phenomenon, but he is not superman. Cristiano Ronaldo’s problem was one of isolation. Carlos Queiroz decided to play his star player in a forward role, and ultimately paid the price. Ronaldo did score in this World Cup, but so did practically the whole side against North Korea. It was his first goal in 16 months for the national team, so it really does show that he is not being used in the correct manner. I noticed that every time Cristiano got the ball, he had no-one around him to pass it to. Portugal were playing in a counter-attacking style and often left the Real Madrid star on his own up front hoping for him to miraculously dribble past two or three players and score. Some Portuguese fans have told me recently they feel Ronaldo doesn’t try hard enough when he plays for his country. I disagree. I believe he actually tries too hard, but is often stranded on his own up front, with a mountain to climb every single time he touches the ball. And what about Rooney? Wayne didn’t look 100 percent fit and he lacked the sharpness that we have come to expect from the Englishman. In four games, he managed only six shots on target, and that is simply not good enough. Besides fitness, Rooney can also blame a lack of service from the midfielders. Neither Frank Lampard nor Steven Gerrard provided enough passes to the front man, especially around the box. I saw the Manchester United star run around aimlessly too often, desperately looking to get the ball. And he did not see enough of it. How do you see the Netherlands will win it all ? One thing i realise is that never under rate any team either big or small team. Team must be well prepared. I totally agree with Mr. Pinto's analysis. Too many things stacked against the three. Does their World Cup performance mean that they are worth any less as players? Definitely not. They are still 3 of the best players in the world. But they are human and they cannot possibly be everywhere on the field. Their opponents' defenses were ready. Simple as that. La Germania ha unito 6 giocatori dell'Europa Orientale,3 Africani,1 dell'Europa meridionale e I Sudamericano i quali giocano in 7 città tedesche nel corso dell'anno hanno avuto modo di amalgamare tra loro. If only countries could pick and choose who to play, regardless of nationality. I would have liked to see any one of these forwards play for the US. So many great passes from Donovan that might have been converted into goals. I'm rooting for the Netherlands too. Go Oranje! I believe that with Wayne Rooney,if he was to get the services he gets at Manchester United he would hve performed better. I love Germans Team.They are playing for the cup.Crashing the unskilled Argentines was one of my happiest event to watch.They re going with the cup.Not only the prepared well,but luck is on them too.Gooooooooooooooooooooooooooooooo on German. I pick Spain to win it all. But to your point the top scorer in this years tournament, Miroslav Klose, only scored 3 times this year in the Bundesliga, which shows you don't have to have a season like Messi, Rooney, or Ronaldo to be successful in the World Cup. Apparently, you just need a good team and a coach who employs the right team tactics. It looks like Germany has got that but I am hoping they lose on Wednesday and Beckenbauer looks like a fool for all his arrogant comments. Star players when they play with their club, they have a special role and they are one of the 11; on the other hand when they represent their country,all other 10 are trying to serve them, subsequently these stars are rather a handicap than asset for their country. 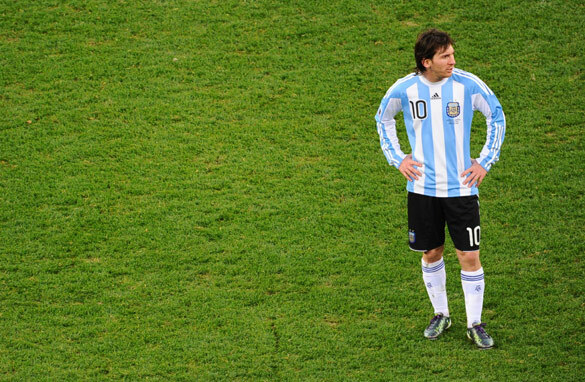 As an argentinian, i think Messi didn´t score even once, but he created plays for his partners to score, and he was the most outstanding player of my national team. He is still the best player in the world, and he is only 23 years old, he has a long way to go. I think Messi had an acceptable world cup. He did not score any goal but he assisted his teammates, he played well and showed some of the skills he performs in Barcelona. Ronaldo and Rooney, big deception. I like your prediction, I hope you are right. Germany is looking strong too though. As for the players that you mentioned in your analyses: not only were they being used wrong. The fact is that specifically Rooney is overrated in my opinion. Rooney will do well in England because of the football style there. He will always come short on the European mainland where defense is more sophisticated. Ronaldo didn't have the feeders he has when playing for his club and neither did Messi. They maybe good strikers but they cannot do it alone. Also their national teams played diferent styles from the ones their clubs use. The clubs styles are build around their star strikers and make them look good. Not so for the national teams. The result was inevitable. The same is true for Van Persie. He doesn't have the feeders he is used to in England and the playing style is different. At least he is used to and knows the style from his earlier days. In contrast look at Klose. He is shining because he is being used in the way he should. Many of his goals were easy ones and he has the right people feeding him the ball once he gets in position. Messi has "most shots on target" and "most shots blocked" of any player in the tournament. And only is 2nd by 3 shots of Ghana's Gyan for "Total shots" at 30 shots. Messi had an average tournament, he did not Fail or "fell-flat" either for that matter. Messi was the best player for Argentina, as Pedro said he is not superman, you need a team to win, there was no creative midfielder to support Messi. And with a defense like that, its a miracle they reached this far i would say. Very nice analysis of what went wrong with the supposed superstars in the world of football. Personally, I feel the whole perspective is starting to change, to a point whee the collective effort of a squad is more important than the before mentioned stars. Look at all the teams left in the WC. Only Uruguay relies on one player that stands out from the rest, Diego Forlan. The Atletico Madrid striker does everything, except defending. The other 3 teams, although they do have stars, are more about playing as a team, instead of hanging back with 8 or 9 players and relying on 1 or 2 players up front to score a goal. Perhaps the best example is the Netherlands. After dazzeling the world 2 years ago at the Euro Championships with a breathtaking display of an updated version of "Total Football", they now have an extremely strong collective, with its 2 strongest players posted in a holding midfield position, Mark van Bommel and Nigel de Jong. I won't underestimate a player like Robben or Sneijder, But their roles and positions have changed, for an example, you would only have to look at the Brazilian's goal in the quarters, and see who was the last man defending Robinho, it was the winger Robben. Same goes for Spain and Germany. They do have top quality players, but they all play as an integral member of the team, not as "the man with a plan". Pedro, I have to disagree, I think Germany can win the cup and their biggest hurdle is not even the Netherlands... it's Spain. Hope you can shed light to your prediction. Rooney was tired because of the premiership's tough schedule, queiroz is a bad manager who couldn't find a way to utilize the best player in the world and Messi had no support, argentina basically had no midfield, mascherano can't do it all by himself so messi found himself forced to get the ball from argentina's own midfield. i agreed 100% with all you said, Pedro. but the overall problem is that national teams don't have real coaches. And even if the players are Euro Champs, like Zaneeti, Cambiasso or Milito, in their National team, they don't have a place. Its all crazy. Queiroz tried to make an "Inter Wall" without a good right side and without counter-attack. Just like superstars failed hard, so did the national coaches of their teams. Never thought I'd say it but the World Cup will get worse with every competition. Overpaid and spoilt players will kill football from the inside. When did football become a living? Silly silly silly IT IS JUST A SPORT! So what you are saying is that those 3 stars are really good when their midfielders feed the ball to them, but when they have to get it themselves it is too much to ask...honestly a guy that scored 43 goals in 49 games and is exactly ZERO in 30 chances in the world cup, does not deserve to be call the" best in the world", that is the case of Mr. Messi. Or maybe the soccer in Europe is not as good after all. I largely agree with you on Messi and Ronaldo but I wouldn't waste my breath on Rooney. Being uttered in the same breath as the greats of today's game is a tribute to British media bias, nothing more. If the final is Germany v Holland it would most boring, more a European Cup not a World Cup. In any case it Germany would deservedly carry it off. i love messi!he is a fantastic dancer!it`s really a pity that argenta lost the game ! Why Messi, Kaka, Ronaldo not good in this world cup ? Is it no feeling to play or the Jealousy from their peer by not passing a lot of ball to them or bad organization from the management ? I don't really not understand when I saw them playing for they countries. I don't understand how Rooney manages to get his name mentioned with the likes of Ronaldo and Messi. He is so over rated it's embarrassing. Being tired from the Premiership isn't really an excuse when the likes of Kuyt can still run up and down the field like he wants to be there. The reality is Rooney just ain't that great, proven by his international record. I will say Germany will win this world cup. They are playing great. On your comments on stars, they perform when paid. Period. I am happy to see an article that reflects my own thoughts. I know a lot of Argentines criticizing Messi strongly for his performance – but as others have said – if you watch him play with Barcelona – it is mcuh more teamwork. I think you could see him and Tevez paying attention to each other but one or two guys couldn't carry the team. And as much as everyone criticizes Maradonna, I think the worse he did was not have a good plan against Germany. He took all too much in stride assuming his stars would pull it off without considering another team as skilled as his own. I think he did good in his selection of players such as Heinze, Higuan and Palermo but I don't think they were prepared enough to work with Messi and Tevez. And jeez, learn a little from Germany's defense – if that was any other team it would have been 6-4 Argentina the way they took shots. I definitely agree that Ronaldo is not being used to his optimal capacity. Despite his many goals at Real Madrid as a forward, I believe he was much better when playing for Man Utd as a midfielder. He was more creative and made other players that much better. From a different perspective, Portugal's lackluster performance could also be because of Ronaldo. Ronaldo is simply too "great" of a player, meaning that his teammates rely on him too much, so their own creativity collapses. The lack of a central character is what makes Germany such a great team this World Cup. Michael Ballack would have been that central character on this team, and I'm happy he is not playing. Because it's his absence that has taken this German team to the next level. England.... The problem with England is that all they know is English football. None of their players have been outside the Premier League so what would they know about other styles of football. It's about time they export their players. It worked really well for Spain, and it showed when they won the Euro. I think Messi had a successful campaign. No goals, but he was the playmaker, and thanks to his help, Argentina made it to the quarterfinals. The lack of a strong midfield wast their undoing. Germany vs. Spain (flashback to Euro 2008 final). Germany definitely learned something because they look a lot more like the Spain of the Euro 2008. Simply beautiful football. Meanwhile, Spain hasn't shown a hint of the flare they did two years ago. Mostly because their only threatening forward is David Villa, and it's easy to block one guy. Torres is not up to form, and not sure why Daniel Guiza wasn't added to the squad. If Spain takes Torres out and starts Jesus Navas, David Silva, and/or Pedro, it will be a great football match. too many excuses! star players are overrated. and there's no I in TEAM! Well what i feel is that Team Argentina was not at all Swift. and most of the work in mid field was done by messi so automatically he was harassed by defenders . Sad...that Argetina lacked Stamina! !.this is what i feel.Messi went on loosing Hope every time. Good but not thorough analysis Mr. pinto. These boys are not as good as we are forced to belief. lets start with Messi: where was him when bacelona played inter Milan and Robin Kazan. when you bring stiff opposition, he will fade out. but when you bring in Arsenal and they like, wenger will tell you messi is frm another planet. Messi is a good player but not in the class of maradona. Rooney: frm day one, this boy is an average player. its only british media that made him a superstar. ManU is structured in such a format as their 10players are all working to feed rooney and when he eventually scores, heavens are let loose. Rooney is not skillful, is not creative but only scores when u feed him properly. CR7 is to me better than the two. but yet he is not wonderful. he uses both legs and is better arially than messi and Rooney combined. These trio is good but not that superstars we are forced to accept. none of then is close to maradona. infact judging frm these WC, M. Klose, T. mueller, M. Ozil frm Germany and D. Villa frm Spain is better them. And on this WC, its only Germans that can stop themselves frm lifting this cup. They have worked for it and they deserved it. Their brand of footbal is Science rather than art. I join you to vote Netherlands lifting the World Cup on Sunday, July 11, 2010. With all due respect. You simply cannot rank Wayne Rooney in the same range as such faboulous players as Ronaldo and Messi. I agree Rooney is a killer, a sniper, someone who can confuse a defense with sheer brute force and hectic rushes. But simply finishing off a played out situation set up by fabulous (foreign) players doesn't necessarily make you a good soccer player. This goes for the entire England team. British soccer teams may have bought the greatest players in the world, some of them having only 2 or 3 British players in the game, their national team seriously lacks technique, talent and new blood. However, when you hear them, there's no better football player then the British. The British always are the first or the best in the World. They have a serious attitude problem. With the money they spent on buying the best foreign players, even a second division team from Luxembourg could win the Europe Cup! But will it make you proud?? well,that was a nice observation,I also realized that all these guys you mentioned,just got puffed up before the tournament started that it got on their heads and not on their feet,Messi was always expecting that no one tackles him just because hes the footballer of the year,Maradona lamented that the refs never secured him enough,he (maradona) was only powered by drugs in his last wonderful football career,maybe he would want his countryman to do the same. Ronaldo and Rooney had the same problem,they boosted to bring the world-cup-trophy to their country single-handedly,no wonder they were all left alone to do it,one tree never makes a whole forest,maybe next 4yrs to come. Still hope Netherlands will make it and not Germany,they have taken enough. You can't base a teams performance on one or two players.It has to be a team effort.That's what makes the World Cup exciting.It's not a just bunch of the world's best players playing for the same team. i believe that people think the players are great by themselves... pointing the messi comment mentioned... in barca messi has xavi...here he has veron but maradona was so focused on giving messi a cup that he wasnt thinking about anything else and veron was out of the field. players are part of a team and if a coach cant emulate the way a player is successful, then the player fails. Ultimately the problem is that while it's nice to have a superstar on your national team it really doesn't help you much if you don't have the right kind of players to supplement him. A club side like Barcelona or ManU can buy the right kind of player, a national team manager can't. He has to make do with the type of players available to him and that is what brought down Portugal, Argentina and to a lesser degree Brazil. It is also what helped Germany advance to the Semis, because Löw has found the perfect system for the kind of players he has. The Germans aren't too confident that they have a chance against the Dutch. I must say they all tried their very best. But soccer is a sport that is unpredictable. Who would ever wonder that Italy, the world champion and France, a strong team would be out so fast? How do you explain that in the match Spain vs Paraguay, each team would miss a penalty kick, and Spain scores at the last minute with the ball striking the poles 3 times before crossing the line? Pure luck!!! Keep in mind, this has been the worst World Cup for bad referees and totally incorrect and inexplicable calls. I bet the final will be Germany vs Netherlands. And the winner will GERMANY. That Brazilian players do not make in this Cup the foremost is a consequence of the decision by manager Dunga to limit the great players to a minimum. He has a strange vision of soccer, in which class and ability play second field to energetic players, more prone to follow Dunga's rules of a football that doesn't strike as the vintage Brazilian. For this reason only Kaka and Robinho could apply to this category, though Kaka has come to South Africa in not idea physical condition. That Brazil is a power house for individual talent is confirmed by some native Brazilians playing in the national teams... of other countries. Next World Cup that shall be convened in Brazil we shall have the opportunity of seeing not only Neymar and Ganso (from Santos), but presumably many others that will strive to follow the steps of Pele, Zico, Falcão, Rivaldo, Ronaldo, Romario and last but not least Ronaldo Gaucho, stupidly left out from the present World Cup. 2) National teams aren't as strong as clubs, and players don't know each other as well. 3) National coaches don't want to build a team around a single player, no matter how good, while club coaches do so all the time. I think it has more to do with not playing that much with your team. You can play 40+ games every year with your club team. But you play maybe 20 in 3 years with your national team. You dont have that same rhythm. I saw a couple messi passes that were to in front or too behind because he didnt know were his teammate wanted the pass. Messi missed some good shots but he also didnt get great opportunity because the team lacked rhythm. Same with Ronaldo and Kaka. Team Chemistry is important. have seen it , turned blind. Hope CNN gives him more chances to express his opinion about the games of half final and final. Thank you so much, my warmest regards to you and your wonderfu coliqs, God bless you all. Cheers ! Rooney just came out an injury. What was Messi and Ronaldo Problem? one more thing even Messi is the best player in the world but still he is just a human being.. so don't give him so much thing to think!! Germany will win. I saw great team work and coordination. Every good player need their team to back them up inorder to generate superstar player. Superstar players tend to dominate the game but without support from team member, the game can not be won. Losting, is a harsh reality. Though there is a great team, without the appropriate tactics and strategy, the game can not be won and then the coach is the one to blame. Not surprised to see Dunga was let go after their loss to the Dutch. GO GERMANY!! They're old news, that's why. Their day is gone. Let them sleep. messi is the best player forever.we love u messi.next time we wiil be winner. Rooney is fagged out (even as far back as the UCL quarter finals). Ronaldo is only great when playing against mediocre teams - the north koreas, xerez, almeria, gijon, hull, bolton, stoke etc. I dare you to recall any "big" game against a "big" team that Ronaldo has ever come to the fore. For Kaka, he just was not fit. As for Messi, he will always play at a certain level, this is never less than 80%. The problem is he will not lift the team around him to his level. If the team plays wel l(Barca) – good , if they play bad - too bad. Rarely do you not see him come to the party. See the matches against Nigeria, Korea, Greece, Mexico and even Germany. He will always give you more than 80%, but the last time i checked his name is Leo Messi and not Clark Kent. With regards to the WC winners, the team that has played the best football is Germany. The Germans deserve to win the WC, but we know that the best don't often win in football. I pray they do, they have been a great advertisement for how the beautiful game should be played. The football messiah was not lucky in this tournament because the necessary supply that he needed was not provided as compared at the club side. messi is the best football player in this planet. spain will definitely win this year world cup. I'm the number one fan of Argentina, but I admired Germany for her success in last match. To be honest, this Germany is the strongest I have ever seen before, including 1990. All guys are very fast, high efficiency and the team work is very good, whereas Argentina just relied on Messi. I agree with you regarding all these three star players lacking support from midfielders, and the fact that the defeated team had no players shifted to the right space so that Mess or Ronaldo could do nothing but tried in vain to shoot and wasted their chance away. It all comes down to which team's players have more energy to hand on to the last minute and could move smartly and quickly to the right space. As to Ronaldo, I find him not so sharp as he used to be anymore, though his team's failure defeated due to reasons mentioned above. I personally think German will win this Cup, as they do not have problems of above while they are quick, energetic, and everybody can shoot and can create chance at any place. Netherlands will come out 2nd, for in my opinion, they are good, but not so good as German in every every aspect. We soon will find it out. Who knows, there is always surprise in this World Cup. this analysis shows once again,that football superstars in your team are not safe way for the team to overcome obstacles...you don't have 11 Ronaldo or Messi or Rooney in the team- you only have one! High-class players combined with middle-class players often result with a failure. Every so often the natural order of things change...this is just one of those years....the season is long in football terms and it shows....how many players have 'peaked' during the tournament. Additionally it is clear that the collective effort for the common good is now the order of the day. But it cannot be so for long. The reality is that many superstar athletes have trouble blending in...with the expected norms of society and maybe because of recent event the world has changed its view....in the end this must change simple because we cannot all be equals, we are not all paid the same, we do not all share the same contracts....All hail the individual...may you come back in a hurry. Cantona, McEntroe, best, Madonna, Rooney, Laimbeer to name a few were fighters and they took losing badly...that is as it should be...the decided how best to win...then went about it. Attitude and a mental toughness that that goes away when you become a winner...but goes away the day the standard you set your self drops. A friend said " In soccer, even if you put all world's best players in one team, their scoring goals is still not guranteed". This is because it is not about individual players like in baseball or cricket, but about team play – proper coordination, support, being at right position at right time. So I wouldn't blame Messi or Rooney or Ronaldo for not scoring goals in this WC. To Rooney and Cristiano I would say that they're more concerned with thier carrer in their team rather than defending thier national teams, about Messi, I think Maradona was not capable of putting togheter a team where Messi could actually show all his tallent. Kaka wasn't in perfect shape and the scheme developed by Dunga was also a mistake, isolating Kaka. So, that way is hard to see them playing as well as they play on their teams. lets get back to history.one team which had least failed to go to a final after competing in a semi-final and further more lifting the world cup is uruguay.this is the fourth time they are playing in a semi-final out of which they lifted the cup twice and went to fourth place once. So,I think this is going to be their year.There is going to be a revolution to football and it has now been started as we all have seen at this world cup. Maybe Rooney didn't get enough service from Lampard and Gerrard, but when he did get the ball, his touch was heavy and more often than not he gave it away or got it stuck under his feet. Messi had a decent World Cup, Rooney was a total flop. He couldn't cope with the weight of expectation. you might also recognise that the world cup has been promoted like the NBA. Where its all about one man teams. These players are overwhelmed with too much expectations from their entire country within a little time to prepare. One thing is to play for your club team which you have the preparation stages for a good season than to play for your country which you practically play with strangers, and they hope their star player would be the savior. None of these players are "fabulous" my god if Pele and georgie best were playing today they would be priceless these guys played with two feet and took a good punch on the chin without falling! Excellent analysis. Too many commentators, analysts, pundits, so called journalists and ranters simply dismiss Ronaldo as lazy, or Messi as unable to rise to the occasion for his country or Rooney as too petulant. Finally a journalist who has hit the nail on the head with thoughtful reasoned accuracy. Maybe, just MAYBE they are a made up fantasy superstars by the western sports media, but really just a FAKE. These players all fall in the same brand as Beckham; product of fake media hype. Now go have a beer and lie to yourself that your countryman Rooney/Ronaldo/Messi etc etc...are not just regional local stars but world superstars...toast!! “You are not a Brazilian. So, you do not know what football means to us,” admonished my friend Elaisa. Brazil had conceded a goal to France, in the first half of the World Cup final game in 1998. Elaisa was sobbing uncontrollably. Tears cascaded down her cheeks. I felt helpless, but also surprised. “Look this is only a game, someone has to win and someone has to lose. Brazil is a rich country and has so much more than football. The Iguassu falls, the Amazonas forests, Rio, Copacabana! Why do you weep?” I asked incredulously. “You do not understand, football is not just a game for us, it is like religion for us,” she replied, between her sobs. Then, Brazil lost to France. Elaisa was inconsolable. Of all the days I lived in Brazil, the most horrendous day was when Brazil lost the finals in the World Cup 1998, to France. It was a very depressing, horrible day. Actually, the Brazilians expected to win. They were playing pretty well. In the street where I lived, for almost 10 days before the final match, restaurants were piling up inventories of beer, drinks and food. From the gallery of my apartment, I could see trucks arrive, daily, laden with food and drinks for the celebration. Everyone was gearing up for a Brazilian victory! For, had Brazil won, there would have been a carnival for ten days. People would have sung and danced endlessly! The bands were ready to burst into carnival music! Unfortunately, Brazil lost. The munificent preparations were wasted. The streets were empty. The night was ghostly silent. There was not a car on the street. Not a leaf moved. I could not bear to be home. I went down. The restaurants were empty. There were a scattering of people, all very depressed. It was as if, a pall of gloom had descended over the capital. I sensed, it was across the country. Had Brazil won the match, Paulista would have had 3 to 5 million people, on it, celebrating non-stop for many days. Now, Paulista was deserted. It was very sad. It hurt me a lot to see how poignant the country was. Everyone was miserable. Marcos, the owner of my favorite restaurant, at Rua Oscar Friere, was sobbing uncontrollably. “Look, take it easy. Brazil will win next time,” I consoled him. “I cannot wait four more years. I want that Cup today”, he responded vehemently. Unfortunately, the Cup had already gone. “What happened yesterday?” I asked Silvester, my driver taking me from my house to my office, the next day. He exploded, “Are you joking with me, ‘chefe’ (boss)?” he asked. He erupted into a 30-minute tirade in rapid-fire Portuguese, analyzing the entire game, in which Brazil had lost to France. He was agitated and gesticulating with one hand and driving the car at top speed with the other. I was mortified. After that frightful ride, I never discuss football with a Brazilian, when he is driving a car. four times. This is a great source of tremendous national pride. When the World Cup is on, the entire country turns yellow and green, the colors of the Brazilian flag. The colors of many buildings are changed, during the World Cup. The buildings, 25 floors or 26 floors, are painted green and yellow stripes, to resemble the national flag. Every house has Brazilian flags fluttering. Every car has the flag of Brazil, flying on the bonnet. The colors of the national flag, dominate the clothes of people, of all ages. The ties, which men wear to office, are printed in the colors of the Brazilian flag. The colors of the swimsuits of the pretty lasses in Rio de Janeiro, change to green and yellow during that the World Cup. At Copa Cabana, the signature beach of Rio, 6 out of 10 girls wear swimming costumes of the Brazilian color. Bikinis, called “dental floss", are very thin and even they change into yellow and green strings during that period. Even the sweaters of pet dogs in Sao Paulo, are green and yellow. There is great national pride in the country during the World Cup. The Brazilians support their team by turning the whole country green and yellow. The fever is so sharp and intense that everyone is swept into it. There is only one goal: Brazil must bring home the World Cup. Corporations are smart and adopt flexibilities in the work timings, to enable their staff to see the matches. When Brazil plays, most offices either close down or give the staff a holiday. However, if the match is in the morning around 10:30, then all offices will open after lunch. Suppose the match is at 4:00 o'clock, then all offices close after lunchtime. If, the match is at mid-day or around 1:00 pm, then companies just rent 100 TV sets and put them in every department so that everyone can watch the match. When, when the match is on, everything stops. My apartment in Sao Paulo, overlooked the main avenue, Paulista. It is the busiest street in Brazil. When the World cup is on, there is not a human being on that wide street. It is the main artery of Brazil, but not a person is seen! The entire country is frozen in time, during those 3 hours when the World Cup match is on. Everyone is glued to the televisions in their homes, offices, restaurants, anywhere! Nothing moves. Brazil as a country, simply freezes for 3 hours. Now, passion is one of the greatest drivers of achievement in any field. The Brazilians are very passionate about football. There is passion in Brazil to win, to achieve. The resultant excitement is highly intoxicating. The mood of the country, changes vividly, with Brazil’s performance on the scoreboard. When Brazil scores a goal, the echoes of “Goooooaaaaal” tear the skies asunder. However, if Brazil loses a game, the entire country is plunged into national mourning and pin-drop silence. Brazilians adore football. They love the game. Football, unites the country. Brazil is one of the few countries, which has achieved harmonious integration of people of different racial backgrounds. It is a wonderful national mosaic. The passion for football, is a key unifier of multifarious races and dialects in Brazil. Football is a game, without ideological connotations. It brings a lot of people together, like the music carnival. The top footballers of Brazil, are superstars. They enjoy tremendous respect and adulation in the country. It is the dream of every 5-year-old boy to be a Pele, Ronaldo, Dunga or a Kaka someday. They are revered heroes of Brazil. Therefore, this time, 12 years later, when Brazil went out of the World Cup, I was saddened again. I know, that Elaisa would be shedding tears again, somewhere in Sao Paulo. But this time, I was heart-broken too. Elaisa's pearly tears and Brazil had taught me to “adora” (love) football, as a Brazilian does. Over the years, Elaisa’s team, had become my team. I will not tell you, if I cried or not, this time when Brazil lost. You see, I do not like to reveal my vulnerabilities. I will tell you, however, that when Brazil lost the match, I switched off my television. I have not switched it on, since then. Germany have been made to lok good by some very bad defending. This germany are nothing if the rest of the world actually played in thisworld cup. This world cup will be forever known as the worst one ever! As someone who travels a great deal through my work, I listen to CNN as little as I can, usually reverting to the salvation of BBC World for some "normal" reporting. Well done Spain, the Germans were decent but like evrything in this WOrld Cup, VASTLY OVER-RATED!! They come up against a side that actually played football and lost. Germany are a very ordinary side just made to look good by bad teams and awful defending oh and media over hype. Au Revoir Germany! The World Cup TV programmes are inundated with a commercial from the Qatar Government, making a bid for the FIFA championships, in 2018 or 2022. The advertisement has been executed extremely poorly, without really highlighting any reason why Qatar should win the bid to host the games. It is a fantasy commercial and is almost irritating. The commercial does not position the country, nor does it offer any clear benefits of hosting the games in Qatar. Qatar should not get ahead of itself. It is a small country and has acquired some wealth due to its gas resources. The money should not be wasted on silly advertising. The country has no tradition of football or games. Fine, the country can yet bid for the FIFA games in 2014. But they should have made a stylish, sophisticated commercial. The weak and purposeless advertisement clearly shows, the mediocrity that prevails, when a person or a country acquires money, without any class. This World Cup proved that Messi is superior to Christiano Ronaldo and Rooney in terms of skills and abilities but the amazing part is none of them stood out like a single-handedly domineering Maradona, tank-driven striker bucktoothed Ronaldo, king Pele or majestic Zidane. The overall zeal which has gripped the world, in these current FIFA championships, is like a strong, gripping flu! It is a fantastic experience to see an entire stadium and country rise and celebrate in unison and joy, when a goal is scored. A 1 per cent rise in GDP in any country, or the whole world, will banish hunger and poverty from our globe. But a goal in a football match energises and enthuses people, more than any growth in GDP in any country! Our politicians across the world, could learn some marketing and selling from FIFA and footballers! Just want to record here a big bravo to Pedro Pinto for his excellent coverage during the World Cup - great job, thank you !! Great player struggled because many could not elevate their game. Average good made fewer mistakes ...which means confidence can not grow and feed. The difference between ordinary and extraordinary is that little bit extra....There is simply not that much in it these days. This means that an upset could be in the making in Brazil, a tantalizing thought to carry for four years! In this article I see you name Lionel Messi, Cristiano Ronaldo and Wayne Rooney as your World Cup Superstars who had fantastic campaigns with their respective clubs and scored a combined 110 goals over the last season. Let me remind you that there has got to be a name on your superstars list above who had an equally brillant campaign last season, scoring 29 goals, thus 3 more than Wayne Rooney, but who isn't even mentionned in this article, totally ignored: this guy is DIDIER DROGBA. He also struggled due to injury but yet was present and became decisive for this country, the Ivory Coast, throughout the world cup campaign. Any problems in naming a well-deserved and equally talented superstar even though he is African? Barcelona won the world cup without any doubt.... right now the quality of football and the players it has with the greatest coach in the world.... ! Its a lesson for rest of the world that that a club football can make huge contribution to International football competition – Spanish league is one of the top most league in the world and the quality of players it produces. There are numerous reasons why the big football starts don't perform at events. 2 The hardest thing is not reaching the top but staying at the top – look at Ronaldinho, now yesterdays man! 5 You are only as good as your last game!